Volga-Dnepr Group has taken delivery of its 10th new 747-8 Freighter as it continues to strengthen its fleet development and logistics services partnership with Boeing. 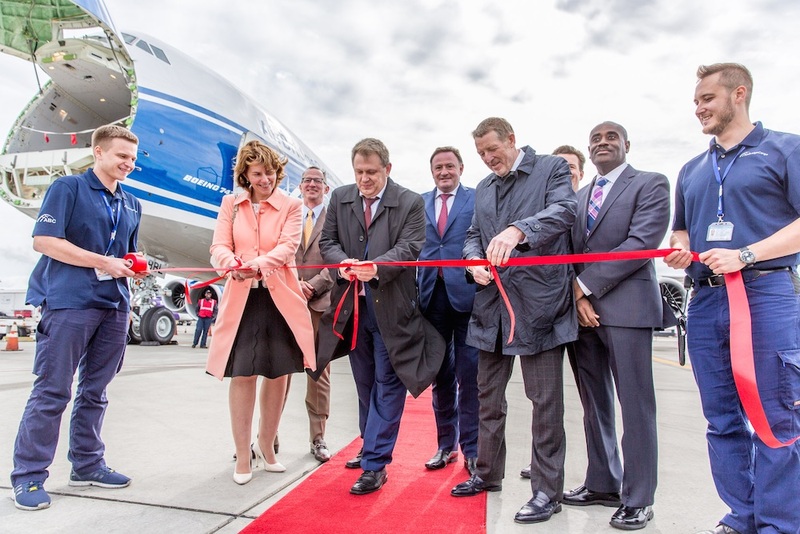 The Group, which includes Volga-Dnepr Airlines, the world’s largest transporter of unique, oversize and heavyweight air cargo, and AirBridgeCargo (ABC), one of the fastest-growing international scheduled cargo airlines, formally received its latest -8 at a handover ceremony in Everett, Wash. Painted in AirBridgeCargo’s distinctive blue and white livery, the new delivery increases the size of ABC’s fleet to 16 747 freighters and continues its long-term fleet enhancement strategy. In July, Volga-Dnepr Group confirmed its order for 20 new 747-8 Freighters and today’s delivery represented the fifth aircraft in this agreement. Future deliveries will lead to the phasing out of the remaining 747-400Fs in AirBridgeCargo’s fleet. The handover event also celebrated the launch by ABC of twice-weekly 747-8F services from Seattle to Moscow via Chicago and Europe. Seattle becomes ABC’s sixth online gateway in North America. Volga-Dnepr Group’s strong relationship with Boeing was emphasized with the signing of a long-term logistics support agreement between the two companies at this year’s Farnborough International Airshow. It covers the provision of logistics services by Volga-Dnepr Group to Boeing and its partners using its fleet of An-124-100 and 747 freighters. “The addition of Seattle to AirBridgeCargo’s growing international network and the delivery of our latest -8 Freighter is not only strategically important to the development of ABC, it also allows our Group to fulfill its obligations under the long-term logistics support program agreement with Boeing and its partners for the transportation of aerospace cargoes. For Volga-Dnepr Group, we are confident our fleet of An-124 and 747 freighters will enable us to successfully compete and fulfill our commitments to our customers,” said Alexey Isaykin, President of Volga-Dnepr Group. Image: Tatyana Arslanova, Vice President, Strategic Management and Charter Cargo Operations at Volga-Dnepr Group, cuts the red ribbon to mark the handover of the new 747-8F to AirBridgeCargo, joined by Sergey Lazarev, General Director of AirBridgeCargo Airlines, and Alexey Isaykin, President of Volga-Dnepr Group.